Excepting Sassoon, Brooke and Owen can you name one other war poet? Where are all the great WWII poets and the Vietnam War poets? Did the First World War poets have the last word on what’s wrong with war? Actually, no. But Owen’s verse in particular tempered a new, gritty realism—gone are the heroics that typified epics likes Tennyson’s ‘The Charge of the Light Brigade’—with a degree of romanticism which made the truth of his poetry palatable, memorable and hard to better. A century on the mechanics and vocabulary of warfare may have changed but has its essence? No. ‘Dulce et Decorum est’ is as relevant as it was in 1917 but who takes Latin nowadays? 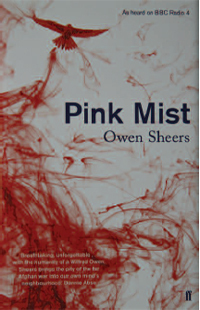 Pink Mist says nothing essentially new but couches it in language the Facebook generation will get. Likely in another hundred years it’ll need updating again. But I did come back. I did. No you didn’t. Not Arthur anyhow. Some other bloke, perhaps. But not my man. Pink mist. That’s what they call it. but goes in a flash, from being there to not. A direct hit. An IED. An RPG stuck in the gut. and that’s all they are. as if some genie has granted a wish. A dirty trick you pray isn’t true. White heat. Code red. Pink mist. One of several powerful images that will stay with you. The language isn’t as catchy as Owen’s but I can imagine this being performed in English classes and holding the kids’ attentions plus the girls are certainly not left with nothing to say; they provide important counterpoint. I can certainly see this on the syllabus in a few years. Alongside Owen, a suitable complement. Aye, but I think that’s why Jim writes, “Actually, no” a few sentences on.